I decided to skip this movie at the theaters because, you know, it’s Winnie the Pooh. Big mistake. Next time, I’ll man up, and watch the kid’s movie. I was right back then; it does, sometimes, take a man to review a kid's movie. That was a promise to myself that I wouldn't let embarrassment get the better of me in the future. Shaun the Sheep was the first real test of this self promise. I mean, Free Birds were a slightly different proposition; as "geek culture" becomes more and more prevalent in pop culture, to the point they are nearly synonymous, watching animated movies, even those with slightly awkward studio pedigrees, is much less of a big deal. But I was fairly certain Shaun the Sheep was meant as a pre-school level animation (I was unfair in this assessment; I was thinking of the spin-off Timmy Time, which is meant for pre-schoolers but is not the basis of this movie); but I made that promise to myself not to let pre-school prejudice get in the way. Good call; this is a pretty good movie. The opening of the movie introduces the main characters of the film; the Farmer, Shaun and his sheep flock friends and the Farmer's dog, Bitzer. It shows them in an idyllic past at first, where everybody is happy, then time-shifts to the present where everyone is, if not unhappy, at least incredibly bored with an endless schedule that never changes. The routine is getting to Shaun, who creates a scheme to trap the Farmer in a trailer, and then raid the house and maybe watch a movie or two for a day. Bitzer puts a stop to this, but not before the trailer accidentally rolls down the hill and heads into town, the Farmer still trapped inside, with Bitzer in hot pursuit. It ends up in the middle of a city, with the Farmer amnesiac, Bitzer lost and Shaun and the rest of the sheep now on a rescue mission to town. In town, an animal control officer who is more than a bit obsessive with his work begins to hunt the sheep and Bitzer down, while the Farmer uses his sheep shearing skills to become a world famous barber popular with celebrities who enjoy bizarre haircuts. Thus the plot is set up, and the movie then becomes a series of set-ups and payoffs as various set pieces and sight gags ensue. This is an Aardman Animations production, so if you're familiar with their work (and, if you're not, you really should make it a point to become familiar), you know what you're getting into. The gags come fast and furious, and many of them are much funnier than they deserve to be. A standout scene involves Bitzer attempting to infiltrate the hospital where the Farmer is staying dressed up as a surgeon. During the course of the scene, he accidentally stumbles upon a surgery about to begin, and of course is mistaken for the operating surgeon. It certainly strains credulity, but it some really funny (if surprisingly dark) stuff. If you're wondering how a dog could be mistaken for a doctor, well, the level of anthropomorphism in this movie is ... a bit strange. For instance, none of the animals talk, usually the first good clue you're watching something worth furry attention. But then again, none of the humans talk, either, beyond some gibberish. Dialogue wise, its for all intents and purposes a silent movie. However, though Bitzer usually walks on four legs, he pretty effortlessly switches to two for his disguise. He also, inexplicably, is able to hide his dog snout simply by putting on a surgical mask. No, it doesn't make sense. However, the joke is worth it. This is an Aardman Animations production, so if you're ... I'm repeating myself. However, my point is, you know you're going to get some fantastic stop-motion animation. I would add the caveat it isn't quite as detailed as earlier theatrical features by Aardman; this is an adaptation of a television show, where budget and time constraints cut down on detail. But don't let that sound like I'm saying this is a lesser Aardman's production. The screen is still jam packed with detail, and the animation itself is top notch. I'm very glad I got up the nerve to see this movie in the theater; this is the part of the review where I point out some audience reaction. That's the disappointing part; I was the only one in the theater. I was worried I would be embarrassed, but now I kind of wish someone else was there to see me bravely watching a children's movie. Or, you know, to actually watch a very good children's movie with me. I stopped reading at "man up". Really, Cross? You think women are cowards? And shame on you, Green, for letting this pass. First off, crossie's a big boy (another ambiguous, gender-linked phrase!) and he can and did post his own review. Secondly, you seem to be assuming that a woman cannot also be a man. Psychologists have long known that a person can exhibit both masculine and feminine traits, to various extents. Gender primarily represents the evaluation of a person's actions by others who share a common understanding of what it means to be, say, a man, or a woman — an understanding which differs between social groups, which has often changed over time, and which may be non-exclusive. In other words, if a person exhibited the traits implied by "man up", they could be called a man, regardless of their own beliefs - their gender identity - and regardless of whether the evaluating group, or a different group, would [also] identify that person as a woman. Because gender is, ultimately, a matter of opinion, it cannot be objectively wrong to call someone a "man", a "woman", both, or neither. If you eliminate the personality traits associated with masculinity and femininity, the terms "man" and "woman" become meaningless, which means there is nothing to be offended by. Conversely, if the terms do matter, they must mean something, i.e. that some people "act like a man" and others don't. Offense can then arise — but only if a person does act like a man/woman, yet is not recognized as such. This sounds very similar to the compliment "that's white of you", which isn't used much today. Yes, in that this implies concordance with stereotypes - good or bad - of "white" cultural norms. Over time, phrases may lose their shared meaning — at which point they become useless; or worse than useless if they drive dissent. For positive stereotypes, this issue arises where the terms are interpreted as exclusive. For example, a Muslim (or an atheist) might be miffed if another person's positive actions were described as "Christian". The flip side of this is that objecting to the use of such a term may be seen as implying that a trait is not held by members of a group. The use of such phrases depends in part on how firmly tied they are to the stereotypes held by members of a social group. While intra-group disagreement about what is, say, "white" or "manly" may cause their use to decrease, groups which retain the stereotypes may continue to use associated phrases, resulting in inter-group friction. Changes in public opinion about particular stereotypes can also decouple words and phrases from their original meanings. This has perplexing results to those adhering to the original meaning (e.g. "you don't have to be male to be a man", where "being a man" is seen as a label with positive attributes that would otherwise be denied to those who are not male). I am reminded of the story about Al Capp's extremely popular "Li'l Abner" newspaper comic strip of the 1930s on for about fifty years. "Li'l Abner" was an exaggerated comedy set in the mythical hillbilly community of Dogpatch, U.S.A., where everyone was a grotesque idiot. Li'l Abner himself shambled about like a gorilla, and often expressed bewilderment by scratching his head and saying, "Mah brain -- hit's strained!" All the hillbillies were "white men". Around the 1950s when black protest movements got started, there were some complaints that everyone in "Li'l Abner" was a white man. Capp added some black Dogpatchers, who were drawn as monkeylike as the white Dogpatchers. There were promptly screams of outrage for drawing insulting caricatures of blacks. Interestingly, those complaints came from new protesters, while some of the original protesters pointed out that at least Capp was treating everyone equally now. The new complaints were so loud that Capp switched to drawing the black Dogpatchers as realistic black men (and women?) This drew still more complaints that Capp was implying that a realistic black man was no better than a caricature of a white man. At that point Capp gave up and returned to drawing everyone in Dogpatch as white. Capp had other p.r. troubles by the 1960s, including accusations of using his prestige as a popular cartoonist on college lectures to demand sexual favors from coeds, and outright rapes, which were pretty much proven. But if the above was true, he seems to have been unfairly accused of racism. I haven't seen the 1925 movie "Clash of the Wolves" with Rin Tin Tin, one of the movies that reportedly saved the brand-new Warner Bros. studio from bankruptcy -- the public loved Rinty -- but according to the plot synopsis, Rinty plays Lobo, a friendly wolf who saves the male lead and his girlfriend. Later, when the townsfolk want to kill Lobo because All Wolves Are Evil, the girl disguises Lobo by putting a false beard on him, and everyone thinks he's a regular stray dog as long as he wears it. "Clash of the Wolves" wasn't a comedy. There are several excerpts from it on YouTube, but not of that scene. Too bad; I want to see it. There's a Hollywood urban legend that the first Academy Award for Best Actor almost went to Rin Tin Tin. P.S. : I, too, saw "Shaun the Sheep: The Movie" in a practically empty theater. I think that my sister and I were the only ones there, and she was there only because she had to push my wheelchair. I liked it okay (but Aardman's "Chicken Run", "Wallace and Gromit in 'The Curse of the Were-Rabbit'", and "The Pirates (Band of Misfits)" were all much better), but she didn't. 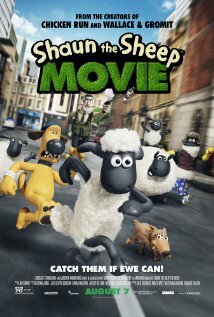 I felt that "Shaun the Sheep: The Movie" is too British for American kids. One scene that doesn't work for either is in the restaurant. The sheep (and Bitzer the dog) are all successful at disgusing themselves and passing as humans in the Big City up to that point, but the sheep suddenly don't have a clue as to how humans are supposed to act in a restaurant. I too, saw this movie to a (near) empty theater. My apprehension of attending this movie as a lone adult dissipated once the film started, at which point the animation's charms and humor took hold. My only company was a father and his two young sons (who seemed to enjoy the movie very much judging from their laughter). Glad I saw it. The restaurant scene is one of the highlights, as was the jailhouse setting and its colorful inhabitants. I thought about asking if anyone else did that in the review somewhere, but it really didn't fit anywhere. Now I regret I didn't! Going to movies alone is not unusual for me, I'm anti-social enough it doesn't bother me (especially since, due to living in a rural area, I wasn't just inviting company to a movie but to a 40 mile round trip as well); I've also written elsewhere that I kinda like empty theaters, but then I feel guilty if I also end up liking the movie. Due to my being in a wheelchair, my sister and I try to avoid going to theaters when there may be crowds. But we end up so often in large theaters that are empty except for us that we wonder how they stay in business. This goes for really popular movies like "Guardians of the Galaxy" and "Jurassic World", too. When I go out to the movies on my own I do prefer that others are there. There have been movie experiences made richer due to being in a packed theater of people gasping or laughing in response to a shared event. I'm thinking of horror and comedy films in particular. Comedy films, I can definitely agree; horror films, well, being alone in the dark can certainly help the atmosphere. However, horror comedy can get you in trouble if the crowd is expecting a straight horror; I had to keep suppressing laughter at the crazy climax of The Cabin in the Woods because the crowd apparently thought things like the killer unicorn were supposed to be taken completely seriously. That happened to me at a non-horror "serious" movie; George Pal's s-f movie, "Atlantis, the Lost Continent". It was at the scene presumably inspired by "The Odyssey" where the evil wizard of Atlantis is turning the hero's shipmates into animals by gesturing magically at them and intoning dramatically, "Every day, in every way, you are getting beastlier and beastlier!" I recognized the line as taken from the 1920s mantra, "Every day, in every way, I am getting healthier and healthier! ", that you were supposed to chant every day to avoid getting sick. My grandmother was a great believer. I burst out laughing hysterically. Everybody in the theater looked at me, not in a friendly way. And then there was the Japanese animated feature, “Hermes, Wings of Love”. I saw this in 1997 or 1998, shortly after it came out. I was invited to a screening by a Japanese gentleman who said that it had recently premiered theatrically in Tokyo and had topped the Japanese box office for two weeks; they were trying to get an American theatrical release for it; and as a well-known anime fan they hoped that I would talk it up. I assumed that it was a publicity screening, but it was a private screening in Los Angeles’ Japanese community in what looked more like a church. It was. I was the only gaijin in a solemn group of about a hundred who acted like they were attending a religious service. The movie, about the god Hermes and the hero Theseus fighting the Minotaur, looked like it was based on Greek mythology, but it was presented as a historical drama based on real events. As it went on, I had to fight to keep from laughing at many melodramatic scenes that everyone else was taking as serious history. I don’t believe in laughing in someone’s face at his religion, and this was obviously not a good idea when surrounded by over a hundred True Believers. They did not get an American theatrical release. I later found out that the movie was commissioned in Tokyo by the Institute for Research into Human Happiness (IRH), a.k.a. the Happy Science Church, legally recognized in both the U.S. and Japan. I think of it as the “Let’s have worldwide Peace and Love, after we kill all the Koreans” church, based on their teachings. Every couple of years, they take in enough donations from their parishioners that they can commission Toei Animation Company, the largest animation studio in Japan, to make a theatrical feature around one of their teachings. They have enough believers in Japan that it’s at the top of the charts for a couple of weeks. This was their 1997 feature. They’re still commissioning Toei Animation to make a new one every two or three years. I posted on Flayrah a few years ago that the IRH believes that Satan is an evil furry; an immortal anthropomorphic felinoid general from the Andromeda Galaxy who came to Earth in a flying saucer millions of years ago, and who rules a secret civilization at the center of the Earth where he shoots energy beams up that make surface people (us) have wars and get sick. The dinosaurs became extinct because they were all killed by Andromedean catman Big Game Hunters flying over the Earth on their flying saucers. Don’t laugh; there are over a million believers who are absolutely serious about this. When that 1997 screening ended, I was given a copy of the IRH’s Bible titled “The Laws of the Sun”. You can buy it on Amazon.com. I defy any Christian or furry fan to read it and keep a straight face. I missed it, but now will seek it out. Also, unrelated but apologize for having 2 submissions that I haven't submitted yet.